The Rinaldi-Bernabei Palace is built in 1755 by the unification of several buildings arose on the site of the former monastic structures of the Church of St. John the Baptist. The harmonic main façade is characterized by two twins rusticated portals and three elegant balconies with curved wrought iron railing. The Rinaldi-Bernabei Palace, situated at the entrance of Terziere San Giacomo and in front of Corso Vittorio Emanuele II, civic number 4-8, is located at the side of the Church of St. John The Baptist, on the original site of the Johannite monastery, previously transformed into private homes (in 1465, in fact, the cardinal Eroli complains the presence of local private citizens in the Monastery of St. John). The incorporation of more parts of the building is evident in the rear facade, with irregular openings, overlooking the line of the last city walls of the fifteenth century. 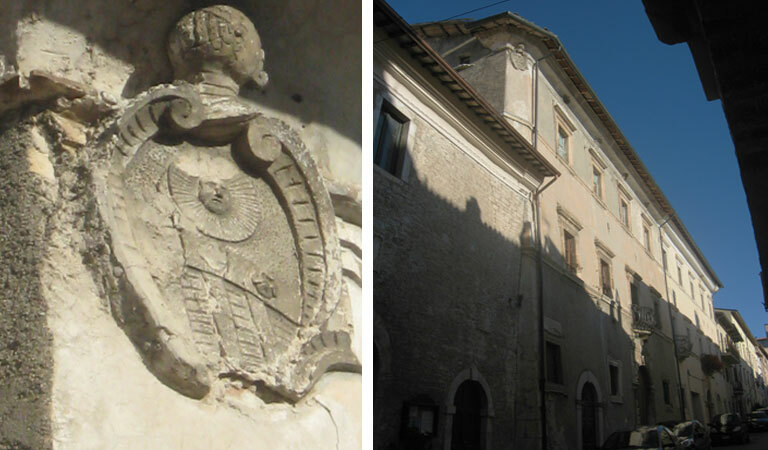 The imposing palace rather has a harmonious main façade, with two beautiful twins rusticated portals with smooth stones and whose reliefs reproduce the coat of arms of Monteleone di Spoleto (lion rampant on three mountains) or maybe Tiberti’s emblem, who has the property of palace. Above, separated by belt courded, there are two registers of windows, with nine openings for the top floor and, in the mid floor, six windows alternating with three balconies (those on the side are of the eighteenth century, while the central ones are a modern reproduction in style). 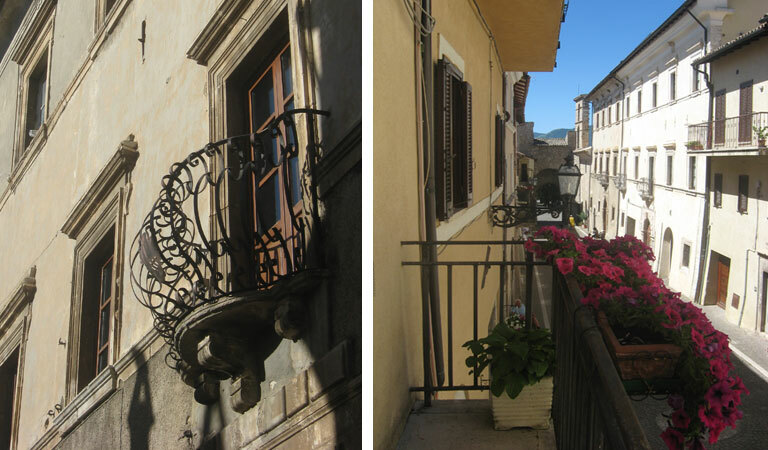 The balconies have a beautiful curved wrought iron railing, with stone decking supported by three overhanging consoles. In the highest part of the facade is the roof frame, whose linear shape is interrupted by some decorative stucco motifs. 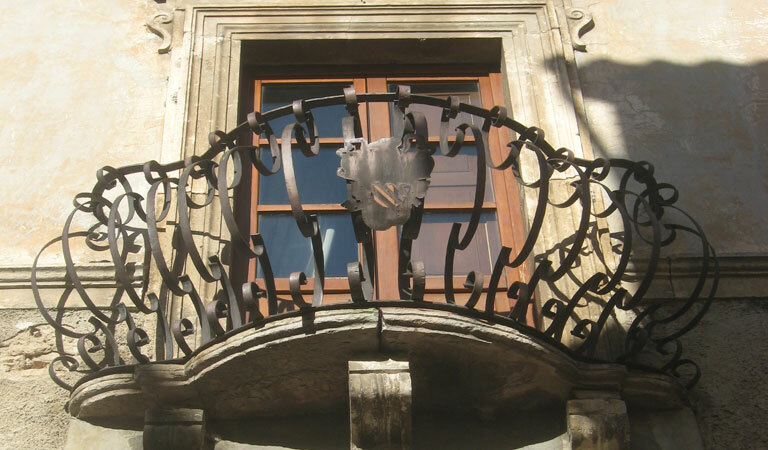 The emblem, which adorns both the ancient railing of the balcony on the left and the beveled corner of the top left of the building, is a heraldic emblem or coat of arms of Rainaldi family. The second motif is a stucco relief and consists of a large shield topped by a helmet, set in profile to the left and with lowered visor; it is truncated by a narrow silver band, loaded with three shamrocks: the first is on the sun with anthropomorphic face on a gold ground, the second is on the three poles (oblique bands) on a blue field. The interior, now divided into several properties and residential units, is still characterized by a rich decoration at the beginning of the twentieth century. During the Fascist period, the imposing structure is the headquarter of "Fascio di Combattimento of Monteleone di Spoleto". The building takes its name by Rainaldi family (or Rinaldi), registered in Monteleone again in the second half of the nineteenth century, and by its subsequent owners, the Bernabei. 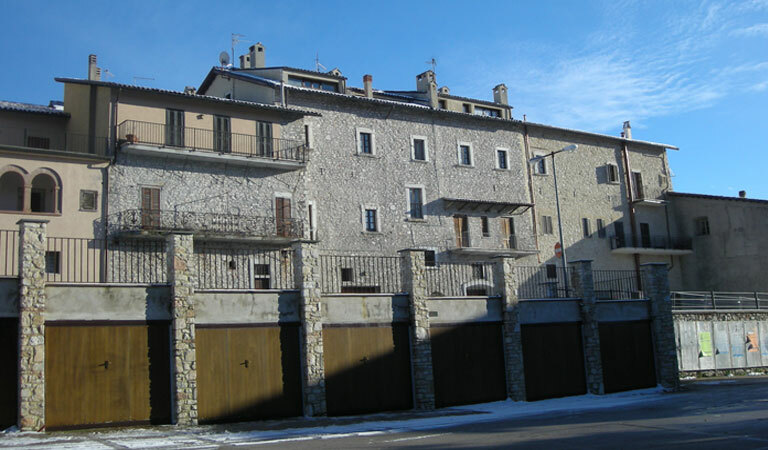 The Rinaldi family has different urban properties and in the surrounding area, including a house in Nempe, one in Butino, in "Trevigaglia district some fields", which are documented in the preservation of a local road called Via Casale Rinaldi, and in a Macario or Maccario farmhouse to Rita Rinaldi in the nineteenth century belonged, daughter of Mariano, who married Bartolomeo Vannozzi. Among its ancestors, there is the notary Maccario Rainaldi of Monteleone, of whom there are records in the years 1556-1563. Another well-known member is the captain of arms Alessandro, who lives between the sixteenth and the first half of the seventeenth century, whose chapel was once preserved in the adjoining Church of St. John, to which he was a generous benefactor. From his numerous sons, one can remember several doctors and the brothers Pasquale, Macario, Domenico and Angelo. 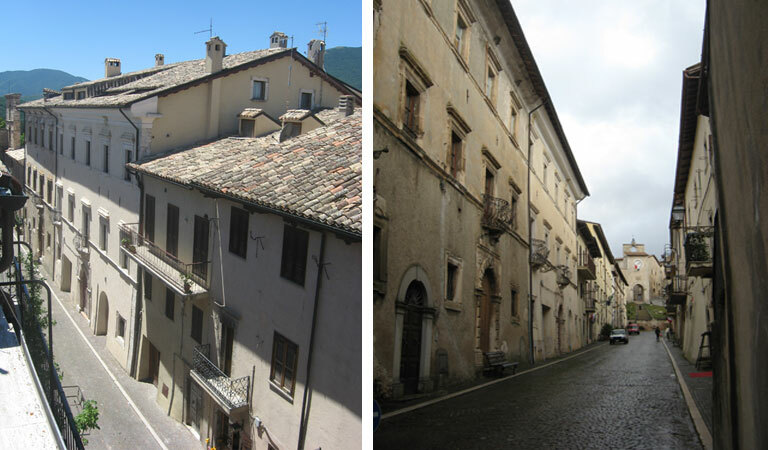 The last one is married to Anna Maria Moriconi and their son is Alessandro Antonio, who is registered in a document of 1666 and is the heir of the houses and of different properties, all concentrated along the village street, made up of blocks of flats, stables and vegetable gardens. His descendants are responsible of the reunification of the various assets in a single architectural solution, which occurred in mid of the eighteenth century (1755). Of Bernabei family one can remember the young prelate D. Barnaba, who dies in 1741 at age 25, and a doctor Carlo Bernabei, "phisicus, fama expertissimus medicae artis", who works in Monterotondo, in Terni and in the Hospital San Giacomo degli Incurabili in Rome, and dies in 1782.